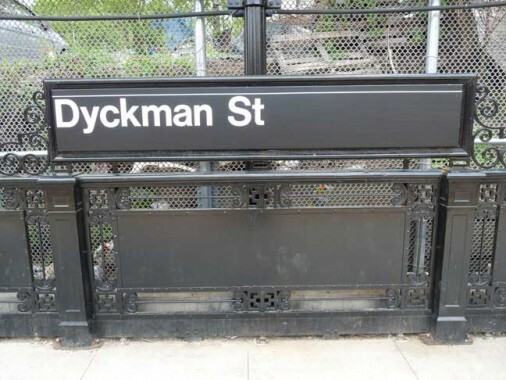 Dyckman is a big name in upper Manhattan — bookkeeper Jan Dyckman arrived on these shores from Westphalia (then under Prussian control) in the late 17th Century, married into the Nagle family and gradually controlled much of upper Manhattan Island. His descendants were prominent US patriots — the British burned down the original Dyckman homestead at what became Broadway and 204th Street, and his great grandsons built the farmhouse that still stands today. 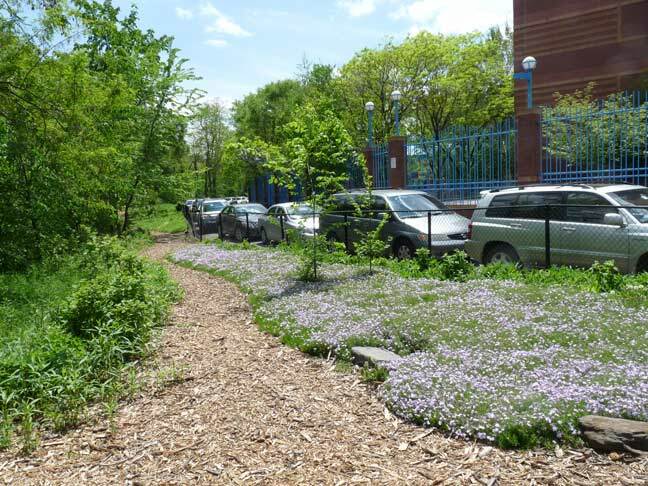 Street names in Inwood were named for early area settlers such as the Dyckman, Nagle, and Vermilyea families — acre for acre, there are more named streets in Inwood than numbered. 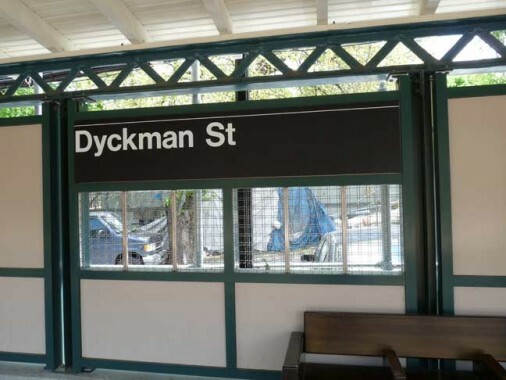 Dyckman Street stands in for 200th Street (when the IND Subway was built in the 1930s, its Dyckman Street station on Broadway was given the number 200, but that’s the only place you’ll find 200th Street in Manhattan. 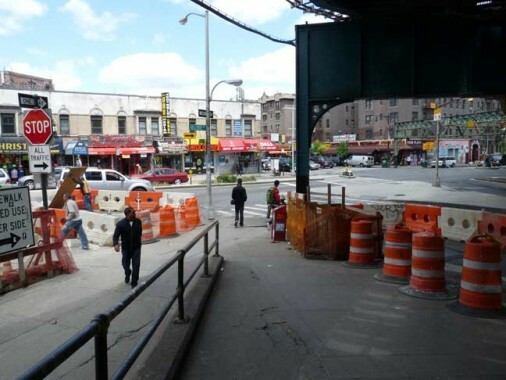 And, there’s no 200th Street in the Bronx, either — it’s replaced by Bedford Park Boulevard). 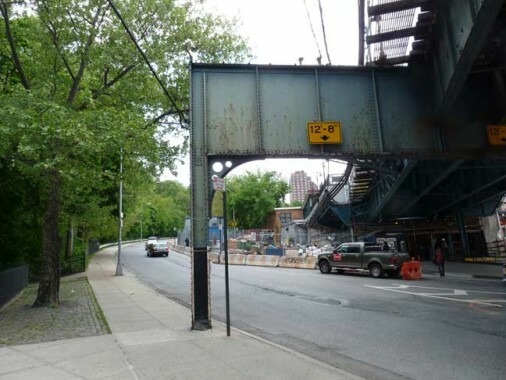 In May 2013, I noted the Parkside Avenue BMT subway station‘s dual nature, partly in a tunnel, partly in an open cut. 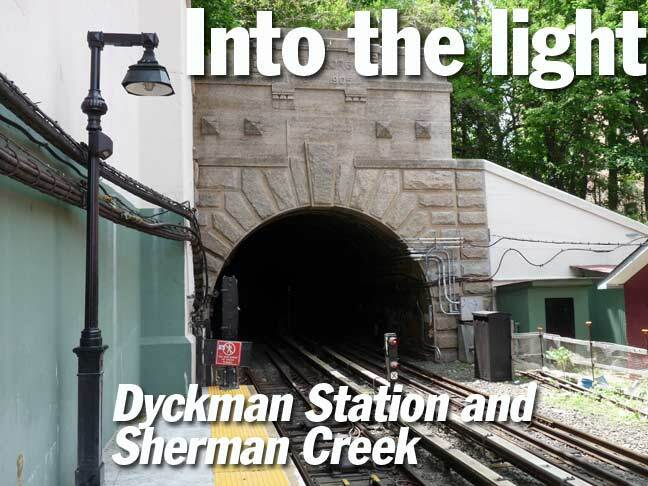 The IRT’s Dyckman Street station goes Parkside Avenue one better — it emerges from a tunnel onto an elevated trestle. At Dyckman Street The IRT emerges from, and enters, a tunnel under High Bridge Park inscribed with the title Fort George and the dates 1776 and 1905. 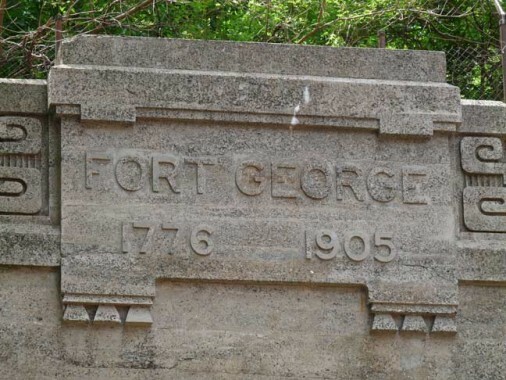 Fort George, originally Fort Clinton, was built by US patriots at about where George Washington High School stands at Audubon Avenue and West 192nd Street. Though the British eventually captured the fort, Colonel William Baxter and his Bucks County Pennsylvania militia were able to hold off British general William Howe’s troops long enough for Washington’s troops to escape to New Jersey (much of the Revolutionary War in 1776 in the NYC area consisted of Washington escaping to fight again). However, as “civilization” crept north to Inwood, the park’s noise became increasingly distasteful and the park came under attack from arsonists, who unsuccessfully tried to burn down the park in 1911, but succeeded two years later. By then Schenck and Loew had sold their interests and went on to the motion picture industry. 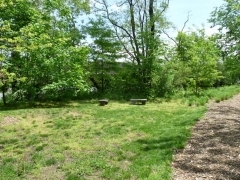 The site then became part of High Bridge Park. 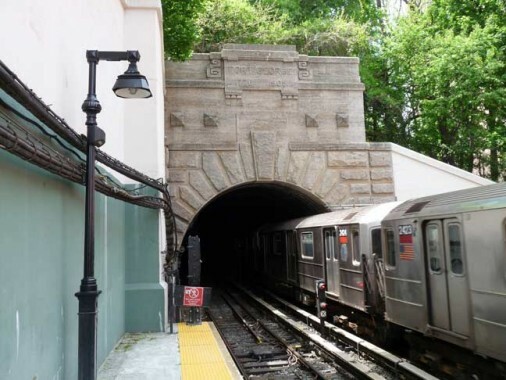 The “1905” date on the tunnel wall simply refers to the date of construction: the NYC subway, that had begun construction in 1900, arrived in Inwood that year. 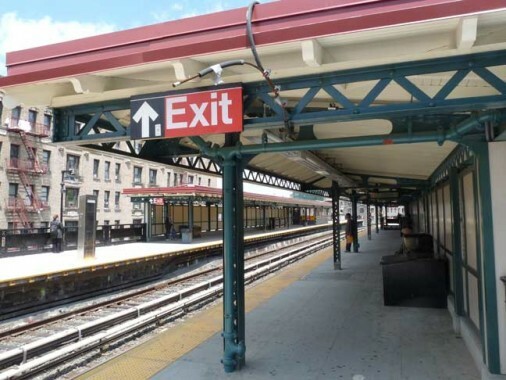 Compare the extended length of time it’s taking to extend the #7 Flushing Line one stop and the BMT 3 stops on 2nd Avenue. 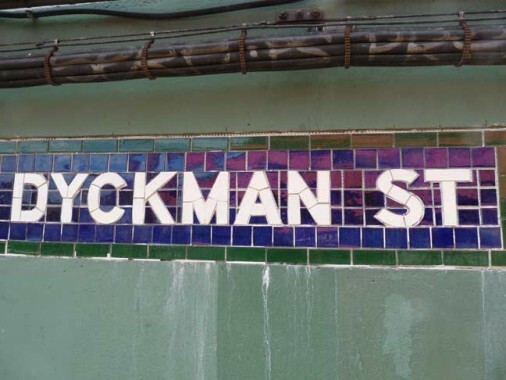 The Dyckman Street station opened March 16, 1906. 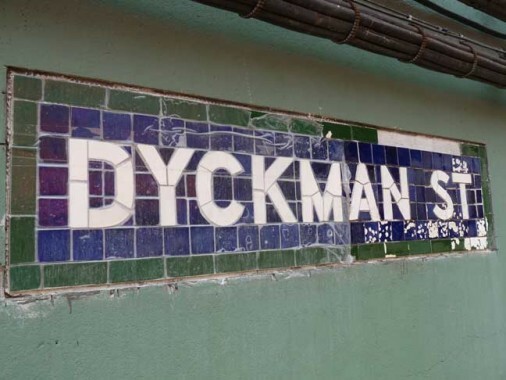 The older tiled signs had suffered from years in the elements, from the weather to birds, so I’m glad they’re restored as part of the present ongoing (May 2013) renovation of the Dyckman station. Some of the protective cellophane was still on the tiles. A new set of platform lampposts has been installed. 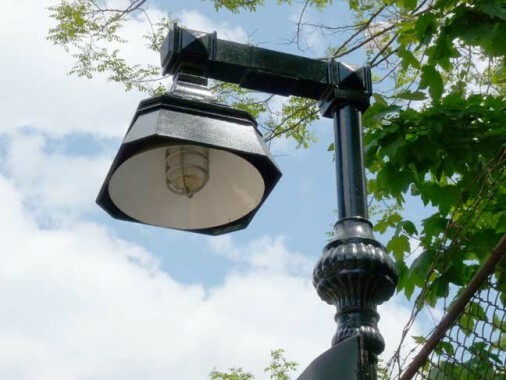 The trend lately is for the MTA to copy former subway lighting schemes, replacing the purely utilitarian models from the 1970s. They follow the pattern of the classic fixtures, which had been mounted on the guardrails as in this 1978 photo. The new design scheme has even carried over to the utility poles carrying electric wiring. 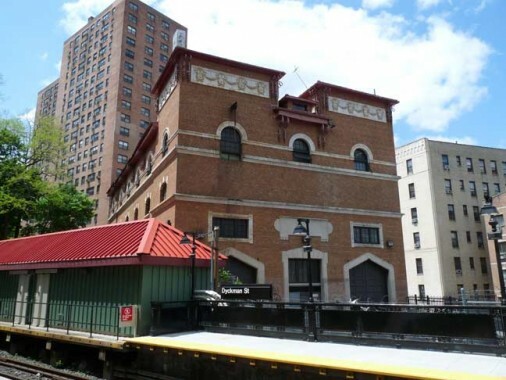 On the southbound side the station adjoins what resembles an Italianate-style building: an electrical substation, constructed along with the subway (see Joe Brennan in Comments). Inwood’s streets are almost uniformly lined with multi-unit apartment buildings like these on Nagle Avenue. Station canopies have been shored up, but the design has pretty much been left the same on the overhead sections. 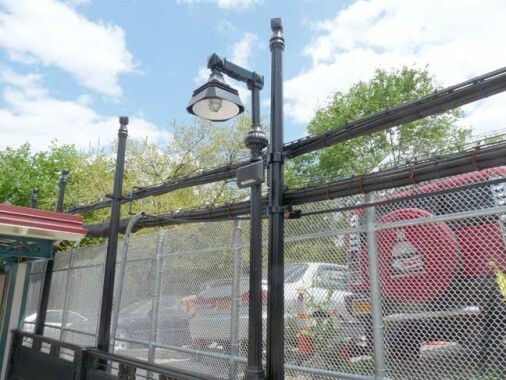 Around town, new modular walls have been installed on elevated stations that allow for identifying signage as well as openings to the outside world protected by wire screens. Stained glass or other types of artwork can be included too. It’s a lot more esthetic than the old corrugated metal walls that can still be seen on unaltered stations. 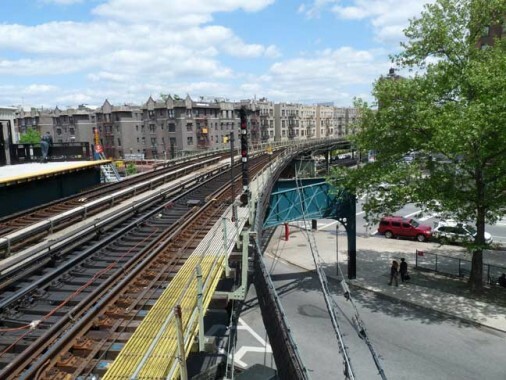 Just as the southern end of the station exits/enters a tunnel, the north end is elevated over Nagle Avenue. In between, the station is on a slanted embankment. 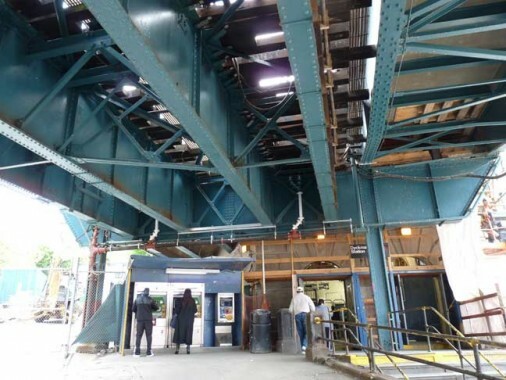 It’s a very ingenious arrangement — as original IRT engineers had to cope with different elevations, some of the stations are the system’s deepest, some are the shallowest, and in the case of 125th Street, some briefly emerge on a viaduct. 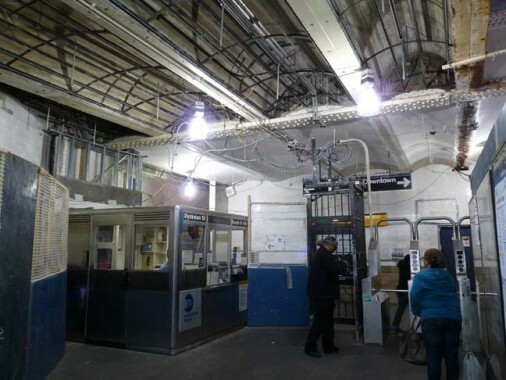 I had heard the Dyckman Street station had reopened after a lengthy period for renovations, but was disappointed to find the entrance was still under construction. I’ll have to return in a year or so to see what it looks like when finished. 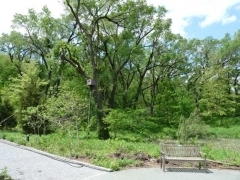 … at the confluence of four streets: Hillside Avenue, Dyckman Street, Nagle Avenue and Fort George Hill. 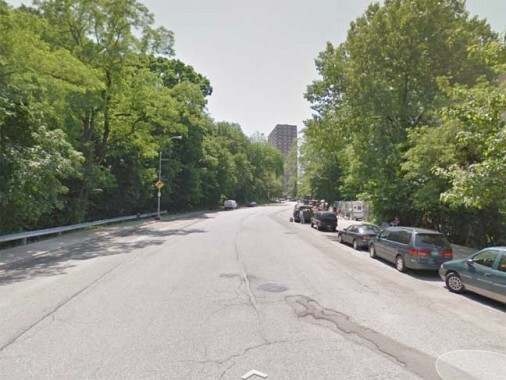 Fort George Hill is a one-way street ascending a very steep hill in High Bridge Park from Dyckman Street to where it meets St. Nicholas, Audubon and Fort George Avenues at West 193rd Street. It’s a rather tough walk uphill. The road is one of Manhattan’s oddities. 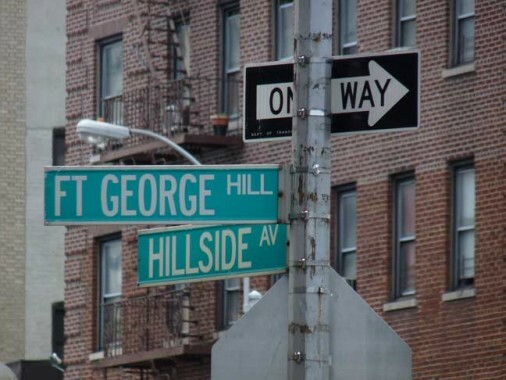 It’s the only street in Manhattan, and perhaps NYC, to be called “Hill,” not Avenue or Street. 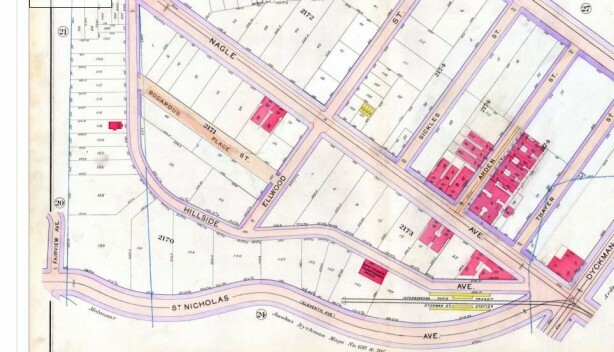 It has also spent time as 11th Avenue and also as the northern part of St. Nicholas Avenue, as seen on the 1914 map. In 1962 it was renamed “Fort George Hill,” which was somewhat redundant as there was already a Fort George Avenue. 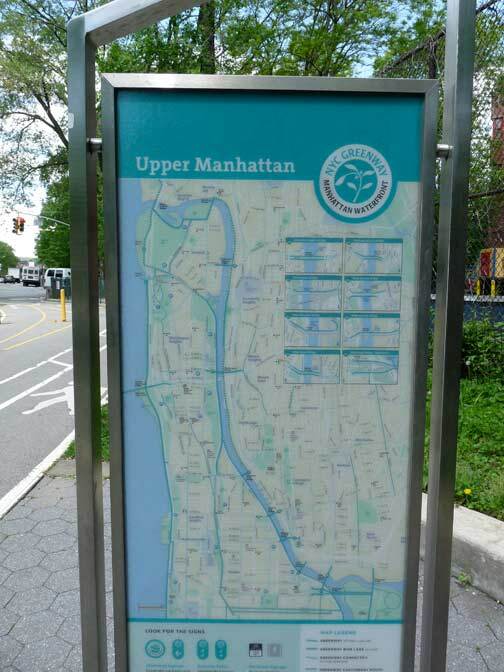 The upper Manhattan map is a strange beast, as two north-south avenues that don’t get north of West 59th Street resume their courses north of Dyckman Street: 10th Avenue, which runs north to Broadway and West 216th, and 9th Avenue, between West 201st and 208th and again from West 215th to Broadway and the Harlem River. 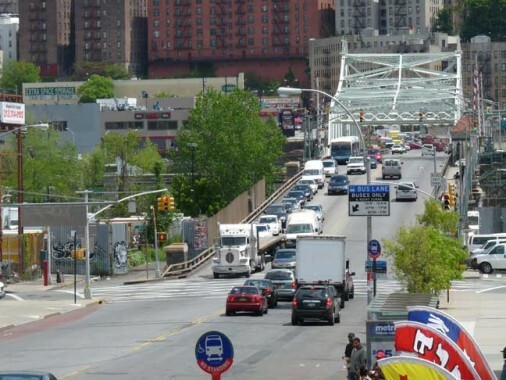 Oddly, the two avenues, which are on the West Side near the Hudson River south of 59th, find themselves on the far east side of the island near the Harlem River here. 10th turns into Amsterdam Avenue at West 59th and runs continuously to Fort George Avenue, which curves to join Fort George Hill at St. Nicholas Avenue. I don’t have the measurements, but it’s likely that 10th/Amsterdam is the longest avenue that travels along the island’s Y axis, beginning as it does at West Street and Little West 12th. 9th Avenue becomes Columbus Avenue, but only goes as far north as West 110th at Morningside Park. 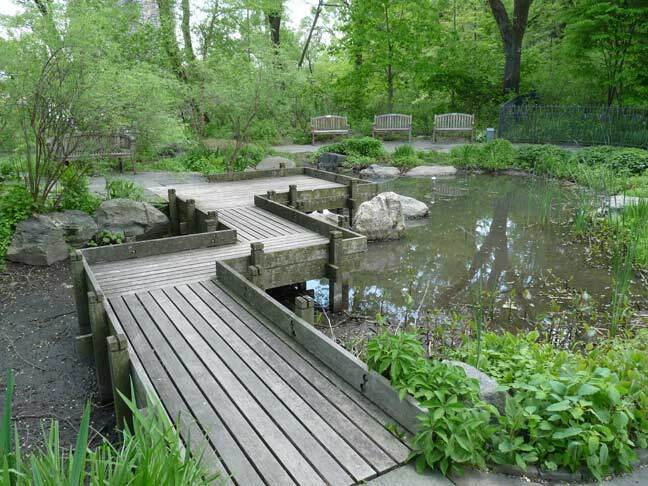 At one time, 6th, 7th, 8th, 9th, 10th and 11th all continued to upper Manhattan as numbered avenues, but beginning in the 1890s city fathers started messing around with the names, as 6th became Lenox, which became Malcolm X Boulevard. 7th and 8th hung in there above Central Park till the 1970s, but then became Adam Clayon Powell Jr. Blvd. and Frederick Douglass Boulevard; 8th became Central Park West along the park, while 10th became Amsterdam and 11th became West End Avenue. For those latter, there must have been a bit of Manhattan snobbery invloved, as the downtowners wanted to differentiate themselves from the uptowners, or vice versa. In any case I followed Dyckman east to 10th and found a very difficult pedestrian crossing, as the Harlem River Drive dumps its traffic onto 10th and Dyckman here. 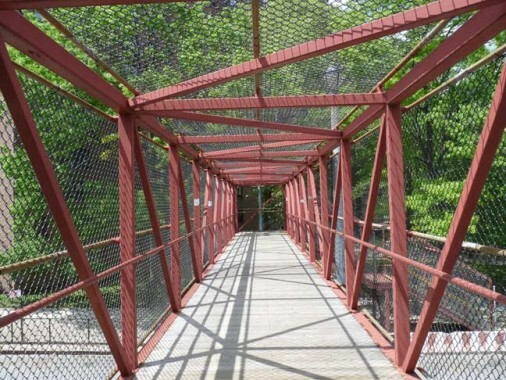 Fortunately the city has provided a pedestrian bridge. 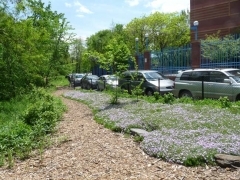 Entering through a parking lot driveway on the east side of 10th Avenue, I found the semi-naturalized walkway beside Sherman Creek, a short inlet of the Harlem River north of High Rock Park. When I was just starting out FNY when the world was young, ForgottenFan Jon Halabi tipped me off to Sherman Creek, which was marked “marina” on a then-current Hagstrom map. What we found was a yacht graveyard full of discarded ketches and pleasure boats. I wasn’t able to get close up and didn’t have an 18X zoom lens, so the yacht graveyard was recorded only in my mind. The spot marked “marina” on the old map is currently occupied by a massive Con Ed substation on Academy Street east of 10th, which in fact has been made even more massive the last couple of years. 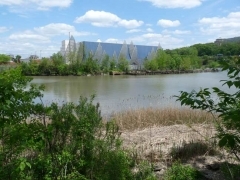 The short trail along Sherman Creek’s south side affords views of the Bronx as well, including campus buildings of Bronx Community College and the dome of the Hall of Fame for Great Americans. 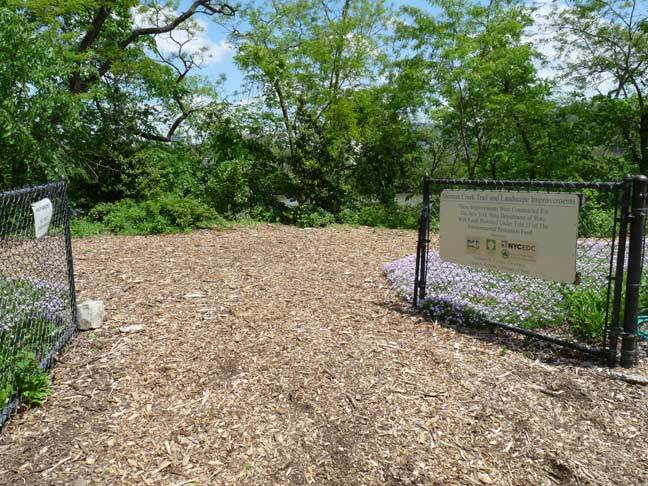 Word recently came that the city wants to expand its composting program, but one of the few compost heaps in Manhattan can be found in the eastern part of Sherman Creek Trail. 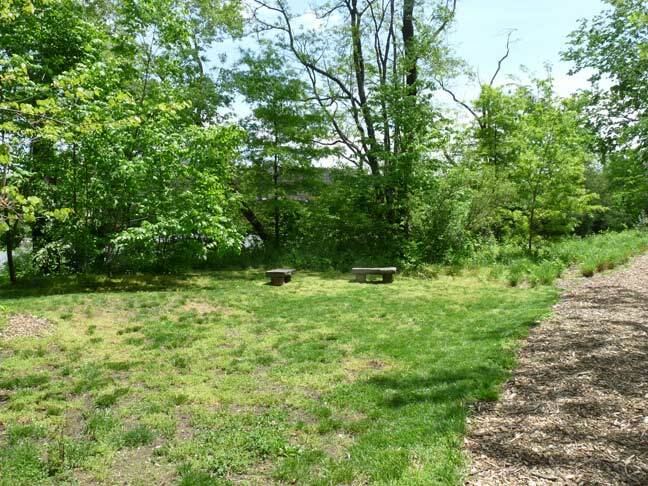 Another compost area can be found in northern Central Park near the Andrew Green Bench — you can tell by the odor. The creek, as well as Sherman Avenue, are named for a settler family in the early 19th Century about which not much is known. 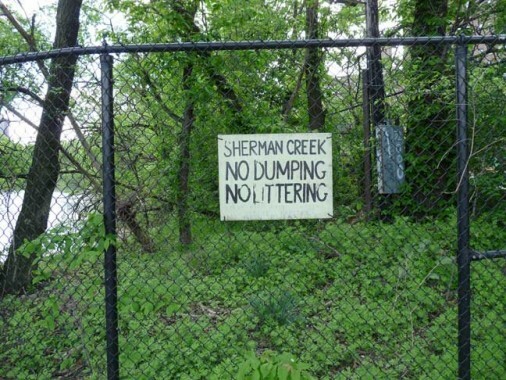 Sherman Creek was originally called Half Kill (the Harlem River was the Great Kill). 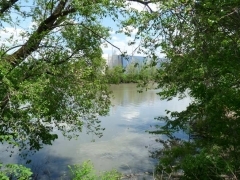 Swindler Cove Park is a recent addition to the Sherman Creek public area, found south of the creek along the mighty Harlem and east of the Harlem River Drive. An oasis of native natural habitats, Swindler Cove features an urban forest, one of the only saltwater marshes on the island of Manhattan’s shoreline and an abundance of wildlife to explore and experience along the Harlem Riverfront. Today, thousands of children from neighboring P.S. 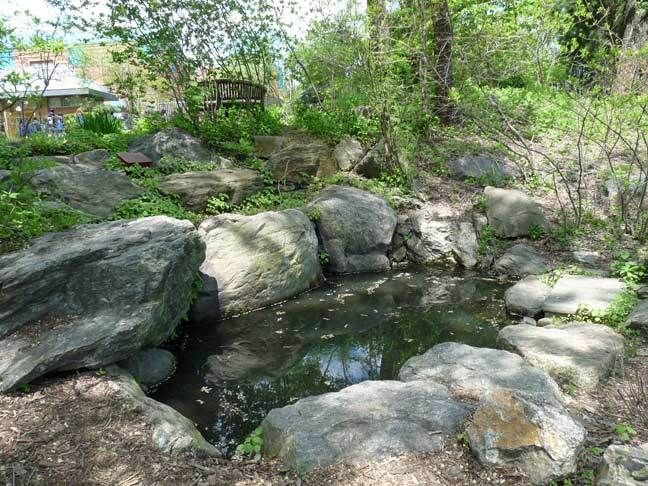 5, other New York City schools and youth from the neighboring New York City Housing Authority’s Dyckman Houses development participate in a wide spectrum of environmental educational programming while using Swindler Cove as an outdoor classroom. 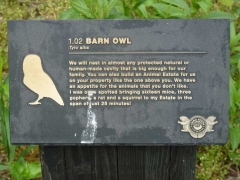 Has this park really been in place since 1999? Perhaps I haven’t paid attention — I’m not up this way that often. 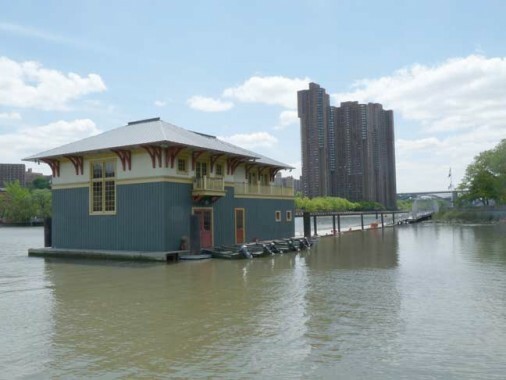 The Peter Jay Sharp Boathouse, which sits on s a 300-ton barge anchored to the Harlem River bed, was constructed by Robert A.M. Stern Architects (designed to resemble the Central Park Dairy with board and batten styling) and opened in June 2004. Storage for racing shells is provided and the boathouse is the setting for rowing lessons along the river. Offices for the Row New York are also located there. Additional photos by Nathan Kensinger in Curbed. 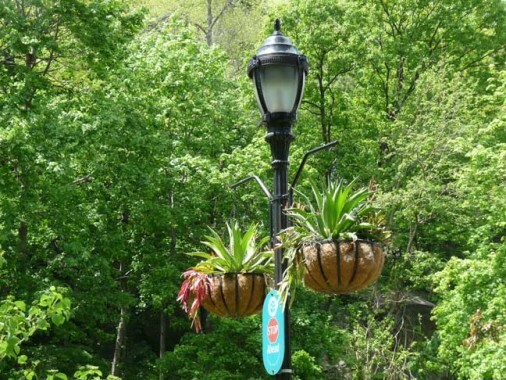 Although the city is increasingly using new “Flushing Meadows” poles developed in 2004 for park paths, he 1911 Henry Bacon classic is still in use here; it is augmented with a couple of decorative vegetation hangings. 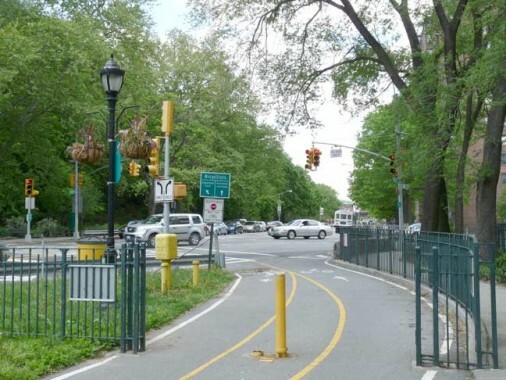 NYC hopes, eventually, to ring the entire island of Manhattan with bike and pedestrian paths. Some areas will be tough nuts to crack, especially those with Con Ed power installations and the United Nations area along the East River. The path is well established along the Harlem River in High Bridge Park. 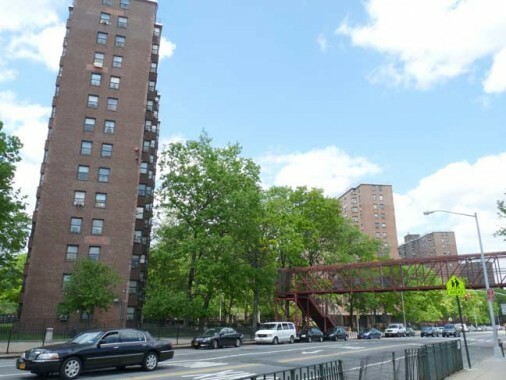 Housing projects like the Dyckman Houses, seen here on 10th Avenue, often act as a check against pie in the sky development dreams. Sign on Academy Street along the north end of Sherman Creek. My walk today was a little abbreviated. I am on my back to the #1 train at West 207th. The University Heights Bridge, which I’ve written about, is seen in the distance. If you’re in the area, check out The Famous Jimbo’s Hamburgers at 10th and West 207th. A filling lunch at a nice price. It’s one of a chain in upper Manhattan. l. The IRT portal always remind me of places in the western US where passenger and freight trains enter/exit lengthy tunnels. 2. Kareem Abdul-Jabaar grew up in the Inwood Houses. Although at the time he was known as Lew Alcindor. I went to PS 152 in the 70’s – great memories !!!! I was there until 1977. My name (maiden) is Kerri Nagle. I have been looking for information related to my paternal grandfather. All I know is that he was a foreman on the New York subway construction in 1914. I just discovered Nagle Avenue. I was tickled to hear of your fond memories of life along Nagle Avenue. If you might have any ideas of how I could find information on the history of the area in the early 1900’s, I’d appreciate it. I grew up right across from the Dyckman Houses, @ 172 Nagle Avenue. I remember the Woolworth’s on Dyckman Street with the full lunch counter and bargain basement. Every year the all-time neighborhood businesses would pay for Dikeman Street to be decorated for the holidays. I like the Kyle Smith. I thought your text was about to say what the Italianate building is! It’s Interborough Rapid Transit substation 17, built at the same time as the station. It is on the National Register of Historic Places. They describe the style as Beaux Arts, but I’m with you, it’s Italianate. When I first saw the picture of the Ft. George portal, I thought something looked different about it. I couldn’t put my finger on it. It looked different because it was no longer grungy and was clean and pristine! You’re right, D. A little cleaning and renovation DOES do wonders. “The site then became part of Inwood Hill Park.” I think you mean High Bridge Park. 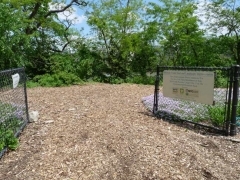 Inwood Hill Park is about a mile north and west of Dyckman Street. You are welcome. Thanks for the quick response. Row New York currently occupies the Peter Jay Sharp Boathouse. NYRA was evicted approximately a year ago. Great visual tour as usual. I say that as a former Inwoodite. 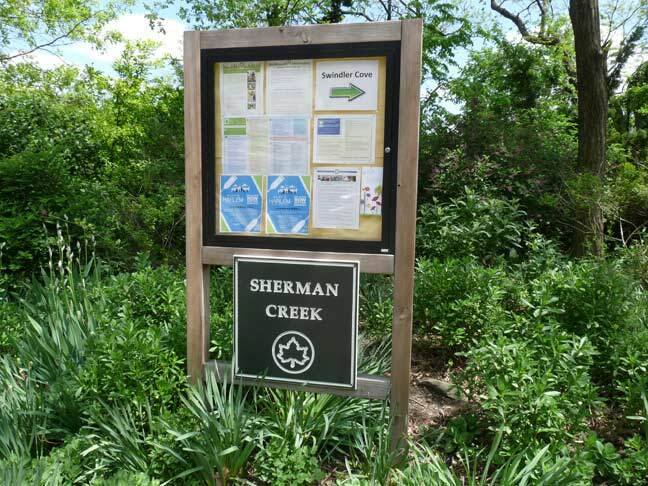 Last fall I went on a walking tour of this Sherman’s Creek area that I found out about in thr NYT. With all due respect, yours was better. Great perceptive column you cite. Alas, based on the Dem field, it’s all going to come true. The story unfurls along the West Side of the city’s hallowed underground cartography, more than 30 years after a zealous band of mapmakers first converged to reimagine New York’s sprawling jigsaw of subway lines. So, the orig 11th Av becomes West End @ 57th or 59th & then B’way @ 107th & then St Nick @ 169th. It does not continue into Inwood as 9th & 10th do. Gary Fonville: there is a new public school on the E Side of 10th, North of Dyckman, which makes for a better scene than in my youth. BTW, one myth when I grew up was that Sherman Ave was named after the General, Not so. Thanks for the tour around my stomping grounds up at the northern end of Manhattan (we’ll leave the controversy about whether Marble Hill is in Manhattan or the Bronx out of this for now). You gave a brief quote taken from the My Iwood site about the amusement park and anyone interested in getting a feel of the current or historical Iwood simply must take advantage of this tremendous resource that Cole Thompson has created. One Inwood landmark that you failed to mention would be of particular interest to those of us interested in the remnants of long ago that are still among us (I assume that this includes everyone who follows this blog) and that is the entry arch to the the Seaman estate that is on Broadway north of the 215th Street stairway (another point of interest which is about to be rehabbed, according to DNAInfo). You can get a particularly good view of it standing on the southbound platform of the 1 train at 215th St. The following links give more on this relic that housed Gallo Auto Body for a long time and appears to still have some automotive connection. 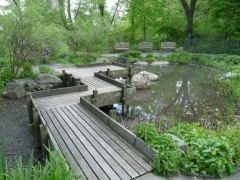 Once you are on the Myinwood.net site, I really recommend spending time poking around there. Please delete my reply submitted on October 7, 2013, in response to comment left by Gary Fonville..Thank You. My family which consisted of my parents, twin brother and a sister, moved to the Inwood Area in 1955. 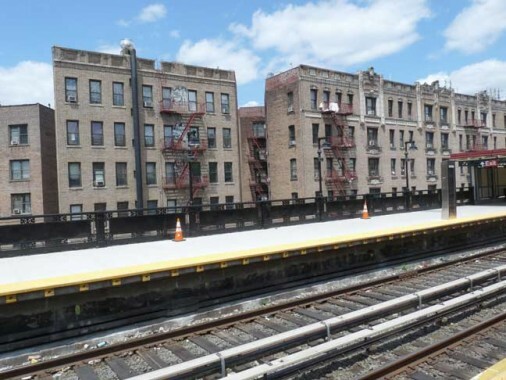 We moved into the Dyckman Projects in 55 and lived there till we moved in `1971. My brother and I attended PS 152 for two years and then because of the building of those two Cooperative high rise buildings up near the top of Fort George Hill we were transferred to PS 98 just off of Broadway. We then went on to PS 52 the middle school and then George Washington High School. We had a lot of great years living in Inwood, made great friends and along the way lost some friends. My brother and my friends explored the Inwood area thoroughly from the Cloisters, Inwood Hill Park, Fort Tryon Park and other areas. We played sports in and around the those places and I did not realized the historical nature of Inwood till many years later. Spent a lot of time on Dyckman Street where my mother shopped and Nagle avenue. My brother and I went to Hebrew School on Vemillia ave . 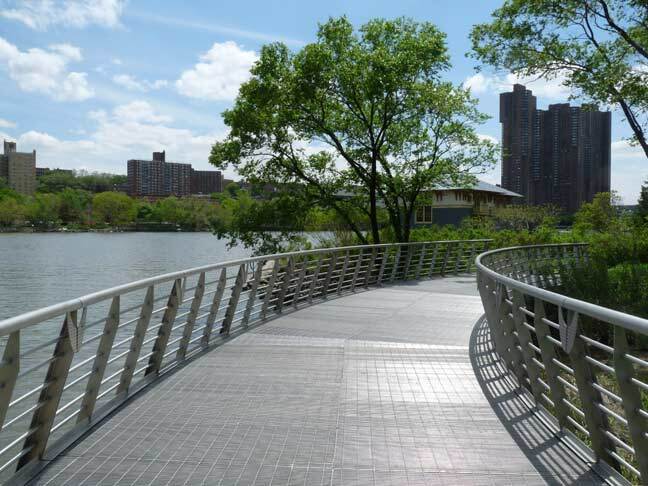 In recent years I have gone up to Inwood and explored the vast Inwood Hill Park and also have visited some of my friends who still live in the Dyckman Houses. HI My name is EDDIE my mother’s name is lucy she worked at the Y Hebrew center on Nagle ave.
My older sister worked at B.K on Dyckman . Yolanda , My little sister Annette the tag along all attended P.S 98 J.H 52, best friend , Ruben . HOW DO I MISS INWOOO . I know all there is to know about Inwood. Every tree ever rock every basement , every roof, playing tag , flying birds seeing the old timers play cards under the train over pass at the end of Dyckman st by the river. fishing at the back of the park by the open bridge . I landed a 12 lbs stripe bass on a old rusted hook baited with a earth worm. One time we was playing in the woods and stumble on a old foundation of a house we dug out some old clay pipes old photos and a old doll . we felt spooked out after digging ti up so we put it back. they was so much things to do an see. And if i can i will do it all over. this is a great site, born and bred inwoodite, dyckman and nagle, right on the corner, 170 nagle to be exact, this crosswalk is confusing me, it on 10th, I think, to my left would be the start of dyckman street, this crosswalk is leading me toward the harlem river, am I correct, I moved out in ’75, this was not here, earlier in the slide show it looked like this was part of IRT dyckman street station, that really confused me ! thanks! great site ! Oh my goodness, I (Lyndsay Silver) lived at 10 Post Ave. and went to St. Matthew on Sherman Ave and 204th St. My best friend Monica (Mona Coyle lived on Post Ave then moved to Vermila Ave. maybe you know her. I used to visit my dad in the 1940s when he worked in the electrical powerhouse shown in the photo along the Dyckman St. IRT station. I live in a town south of Boston, Pembroke, MA. A couple of years ago, I noted a mailbox with the Dyckman name. As I am originally from Inwood, I was interested to say the least. Eventually learned that the people in this home were decendents of the Dyckman family. I was born 1957, lived at 10 Post Ave and went to St. Matthew Lutheran School on Sherman Ave. and 204th St. My best friend Monica (Mona) Coyle also lived on Post Ave. then moved to Vermila Ave. Please reach out if you know me or my friend.